Dehradun: Extensive arrangements have been made for the counting of the Uttarakhand state polls where 637 candidates from 70 seats await the results with bated breath. 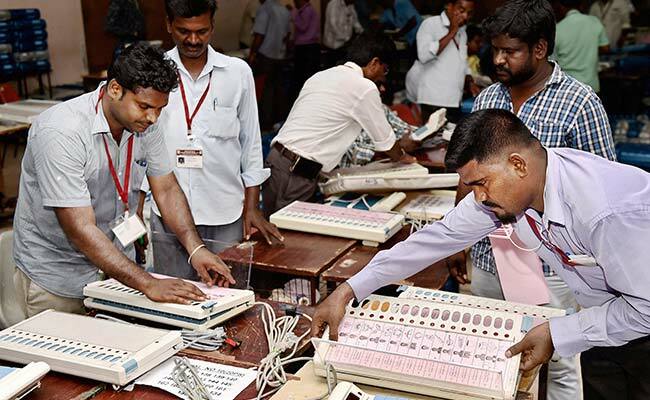 A total of 15 counting centres have been set up across Uttarakhand and deployment of security personnel and counting personnel made as per specifications of the Election Commission, Chief Electoral Officer Radha Raturi said. 864 counting tables have been put up where counting for 10,854 polling stations will be carried out. Ten companies of central paramilitary forces, 14 of Provincial Armed Constabulary, 3,000 constables, 350 head constables, 550 sub-inspectors, 50 inspectors, and 30 gazetted officers have been put on counting duty, she said. Polling for 69 out of a total of 70 seats was held in Uttarakhand on February 15. Voting for the Karnaprayag seat had to be rescheduled by the commission for March 9 owing to the sudden death of BSP nominee Kuldip Singh Kanwasi in a road accident just a couple of days before the polls. Counting will begin at 8 am and go on till all results come in, she said. There are a total of 70 assembly seats in Uttarakhand from where main power contenders Congress and BJP have fielded their candidates. With a number of Congress turncoats trying their luck as BJP candidates this time it will be interesting to watch what happens in constituencies like Narendranagar, Bajpur, Roorkee, Khanpur, Kedarnath, Kotdwar, Sitarganj and Nainital from where erstwhile Congress rebels or their wards have been fielded by the BJP. Barring Amrita Rawat and Vijay Bahuguna, all the Congress turncoats who are also sitting MLAs, have been fielded by the BJP. However Amrita's husband Satpal Maharaj and Bahuguna's second son Saurav Bahuguna are in the fray as BJP nominees. Chaubattakhal from where BJP's Satpal Maharaj is in the fray and Kichcha and Haridwar (rural) the two seats from where chief minister Harish Rawat is seeking a second term, will also evoke much curiosity. It will also be interesting to see what happens in Sahaspur from where PCC president Kishore Upadhaya is contesting. Ranikhet is important as state BJP president and Leader of Opposition Ajay Bhatt is contesting from there whereas Dhanolti holds much interest as Congress is supporting independent nominee Pritam Singh Panwar from the seat despite fielding Manmohan Mall from there.